When you’re in a transitional period, it’s the in-between time. That space where you’re about to lose the security of the old and not yet attained the benefits of the new. And sometimes it could be terrifying. My guess is you’re wishing that some aspect of your life would shift but don’t know how or where to start. I know how it goes. You’re tired of the old but are startled of the new. Despite the unlimited potential, growth and new horizons that change presents, I understand how and why you’re apprehensive to accept it. Your mind is riddled with questions, self-doubt, and anxiety for the unknown. There’s so much in life that lies outside of our control, however, transitions channeled in a positive direction could be an opportunity to unveil a meaningful life. What if you could embrace change as a source of power rather than a cause of fear? This space offers practical tools and resources that not only will deepen your capacity to deal with transitions but will lead you to an optimistic + resilient life where you’ll be determined to make things turn out well. Here you’ll find powerful practices for building up your inner resources and harness the power of positive emotions to approach situations from a source of strength. Are you willing to own your power and create your happiness in the midst of change? Obstacles can’t be avoided and change is often uncomfortable. 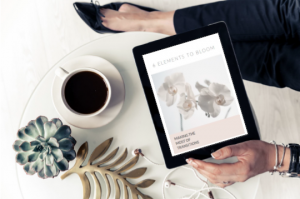 That’s why I welcome you to benefit from my complimentary guide, 6 Elements to Bloom: Making the Most of Transitions, where I share my signature framework for transitions to find inner strength, overcome challenges, rebuild your life and thrive every time you are faced with change. We always have a choice to turn every end into a new beginning. If we do the work, every breakdown would lead to a breakthrough.